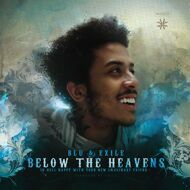 Blu’s first full length LP, “Below the Heavens” pairs Blu with producer Exile on the Sound in Color imprint. His first single, “Narrow Path” has rocked stages across the world, as fans begin to feel the impact of Blu’s music. His delivery flows flawlessly, while the content reflects the joy and pain of working class youth everywhere. Since the release of “Narrow Path,” Blu has performed alongside Slum Village, X-Clan, Platinum Pied Pipers, Lyrics Born, DJ Houseshoes, and many others, while participating in 3 high-profile nationwide tours alongside musical family members: Ta’Raach, Aloe Blacc, and Exile. The buzz has fans salivating for new music. Worldwide, people are looking to put hope into the ‘next’ emcee that will give them the same feeling when they first heard Black Thought, Common, or Slum Village. Blu fulfills this need, but maintains something that is entirely new, while not recycled.